If you are using Oracle database and Geomedia Professional or application based on Geomedia Objects you will probably want to speed up initial connection that might be very slow. In this post I will present to you solution to that specific issue that might significantly improve user experience. Same approach you can apply in many other situation where you can not control or change SQL generated by some tool/software. To start optimisation process you will need to find out which statement causes trouble. That is possible to find out using Oracle tools as Oracle Enterprise Manager. You can login as a same user you are using from Geomedia. After that go to Performance/Top activity and find select statements you are looking for. 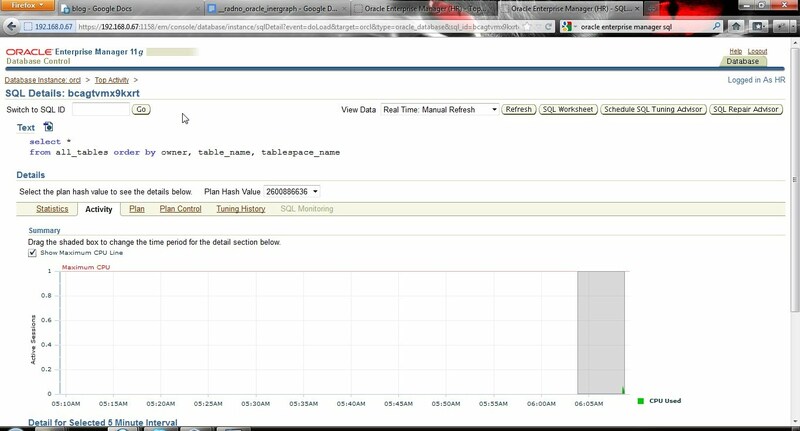 and here is the same query found by Oracle Enterprise Manager (Performance/Top activity). 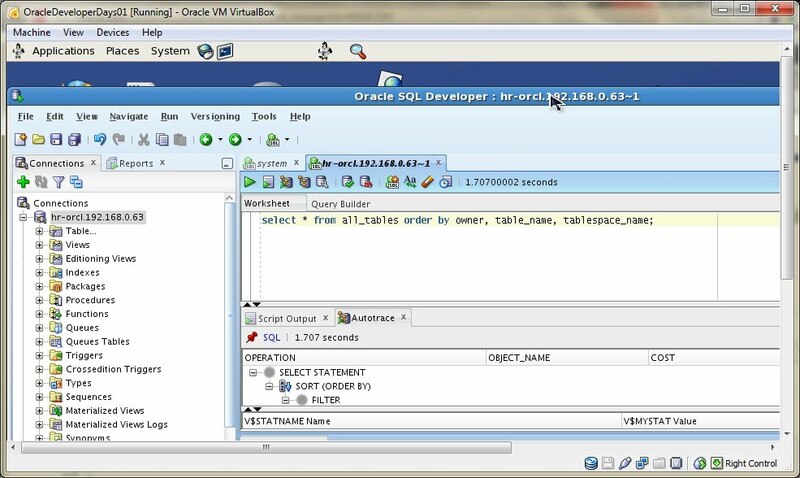 After you connect your Geomedia to Oracle database you will get SQL queries generated by Geomedia in log file. That is a starting point for your optimisation. Let me show you one query generated by Geomedia in the moment of initial connection (open your SQL Plus and try it yourself). Here is the SQL entered in SQL Plus and the content of my spool file (sql-log.txt). You can notice that elapsed time has changed dramatically, from 1:12.36 min to 1.23 seconds! ...just one brief comment.... every time Geomedia connects to the Oracle database, presented query is executed without any optimisation and your users will be very unsatisfied… not only users of your system, you as a software developer or system architect or GIS analyst.... you can also experience great disappointment waiting more than minute .. just to establish connection!!!! … and one more thing, this SQL is not the only one that make you trouble (Examine your log file!). In this post I’ll present you principles you can apply to any SQL. Now it is time to “tell” Oracle when it receives query from Geomedia to run it in optimized form. Here id PL/SQL code to do that. This solution was proposed by Oracle Guru Damir Vadas (Tnx Damir!). Take into consideration that you can not change query (variable: l_sql), take it exactly as it was written in log file. You have to take care only about quotation: double your quotes or use q’[..]’), do not change upper-case to lower-case or anything else. The limitation of this procedure is that you can not optimise queries that have some parameters that are changed every time. Examine reports you get by proposed procedures (pay attention to estimated benefit). From my experience you can leave content of this table as it is and just perform proposed optimisation. If you change content of the table GEXCLUSIONS you wil have to perform optimisation one more time because every new entry in GEXCLUSIONS table changes query (variable: l_sql).